Residents of Highland Park can nominate their own or a neighbor’s garden (or both!) for an Alley Garden Award. Please complete the nomination form online and submit it to the Highland District Council between Sunday, June 1st and Monday, June 16th, 2014. No nominations will be accepted after Monday, June 16th. Submit Nominations On-Line or download and mail Nomination Form to the Highland District Council. 1. The property must have an easily recognizable house number on the garage (or elsewhere in the alley if there is no garage). 2. The garden must be along the alley and on the alley side of any fence. 3. The alley garden must be weed-free and well-maintained along the entire property line. 4. The alley side of the property must positively contribute to the character and beauty of the alley by being litter free and neat. 5. The garden fits the following definition as an area of land (which can also be contained within pots) used for the cultivation of flowers, vegetables, herbs, or fruit. Volunteers will start judging alleys in the neighborhood on Thursday, June 26th and wrap up on Tuesday, July 1st. 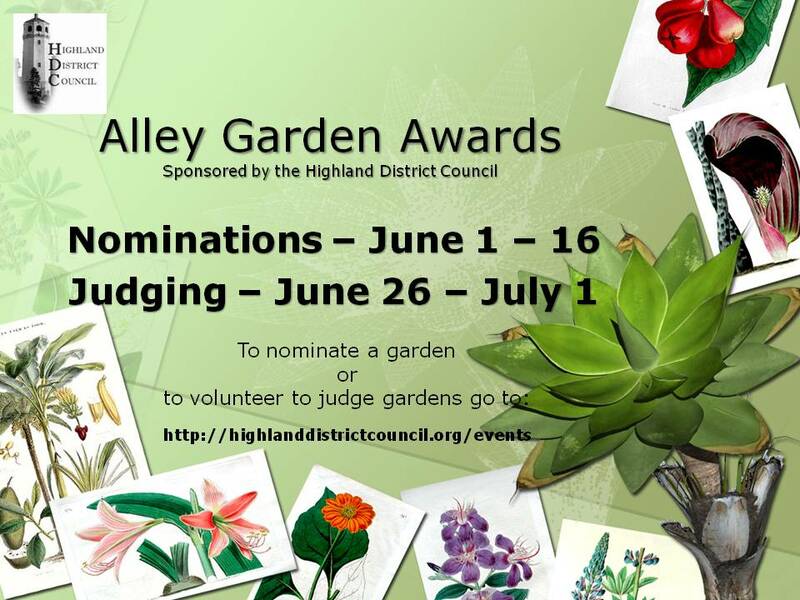 If you see an Alley Garden Award volunteer judge out looking for qualifying gardens, please take the time to thank them for their hard work! Judging starts Thursday, June 26th and runs through Tuesday, July 1st, 2014. More information on training to follow. To volunteer as a judge, contact Patty at hdccrime@visi.com. Planting a few perennials here and potting some plants there can make a huge difference in improving the aesthetics and safety of your home. Studies have shown that beautification deters crime. Prepare your alley side property in time for the Alley Garden Awards and help prevent garage burglaries and other crimes facilitated by unkempt property. 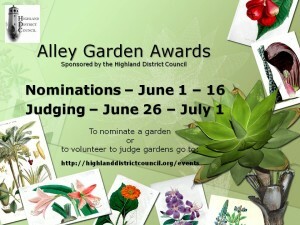 For more information about the Alley Garden Awards, please contact Patty at hdccrime@visi.com. Our thanks to the Macalester Groveland Beautification Committee for permission to adapt their materials for use in our event.